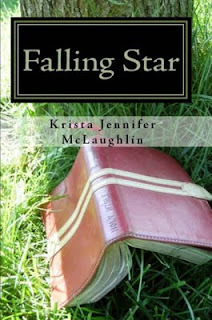 "Falling Star" was my very first novel that I wrote. I wrote it during NaNoWriMo (National Novel Writing Month) of 2008. Admittedly, I self-published this book in 2011 and after a few months, I took it down. It's really not that good and now it will only live on my computer, hidden in a file. I am still quite proud that I wrote it, but it's just not to be read. I think almost every author has some book on their shelf that they wrote, but won't share. The inside of the building was warmer than the December wind that had threatened to bite my wounded skin. I walked down the maroon carpet, leaving wet shoeprints. Pushing open the heavy oak door to the sanctuary, I looked at the dark pews and faded light coming in through the stained glass images of Christ and the cross. When I was younger, I used to stare at those windows for hours and now I could barely glance at them. Resting my hand on my empty stomach, I knelt on the floor in front of the pulpit. Tears trickled down my cheeks as I stared at the wooden cross on the wall behind the grand piano. Was God still there now? In my heart, I knew that the silence and peace of the sanctuary was my only answer. I couldn’t have my baby back. God was showing me that he wanted me to know that he was in control and I wasn’t. My life hadn’t been in control since that fateful day in October when my fairy tale ended. Looking up with angry tears cascading down, I saw my answer. Hung upon the wall with a crown of thorns on top was the cross. On that cross an innocent man had died. Whatever I was suffering, God has felt it a million times over. His only son died upon a cross like a criminal when all he had done was come to love and teach us. I may have lost my baby, but God lost the world through Adam and Eve and to save to the world he sacrificed his son. I was a fool. God loved me even more at this moment and he was cradling me in his arms, comforting me like a small child that tripped and scrapped a knee. Sobs exploded from my chest as I wished that I could be whole again. Do have something that you wrote and it's hidden in a computer file? A very revealing scene--and it's the truth. I have several manuscripts on my computer. I often think about rejuvenating them, but then think no---not now. I like the title--Falling Star. Thank you Lindi. I've thought about rejuvenating it, but it is gonna have to be years from now. I'm in the middle of writing a new novel, revising another, brainstorming revisions for another, and the second part of the one I'm writing - the sequel keeps popping into my head! I love the title too. It's because I love stars. And her story mirrors how a falling star is only seen for a moment, and we'll remember it for that moment... but after, it fades. Yes, I do have something on my computer that most likely will never see the light of day, but I keep working on it thinking maybe one day I'll get it right and it will be worth publishing. There are some major things that would need to be fixed before I would consider publishing it again. Maybe in a few years I'll get around to it. :) I'm honored that you liked my post so much!! Thank you! A pain-filled excerpt that erupts with awe and understanding of Christ. Thank you so much with sharing this today. Very touching. I agree with the other commentors. You should fix what you need fixing and try again. It sounds beautiful. Maybe it just needs a little editing. I have a lot hidden in my harddrive lol. I do love that cover :) And the excerpt was just as amazing. Oh that last line makes my heart ache for the poor girl. Like Cassie, I also love the cover. A beautiful excerpt and a fitting post. I think it's inevitable that any writer, or anyone pursuing writing, has something they've written hidden away in their closet of skeletons. Yes, now that you dusted that piece off, maybe you could do the same with more of it. Nanowrimo 2010 sits on my computer...2 people were given access to it in its entirety...felt scary! I actually might. Thanks Andrea! I had a poem called "Job" when I was hunting for a job and it also doubled as a very Job-esque cry to God in pain. It's dripping with angst, inconsistent in style, and I am perfectly content to hide it on my hard drive forever.